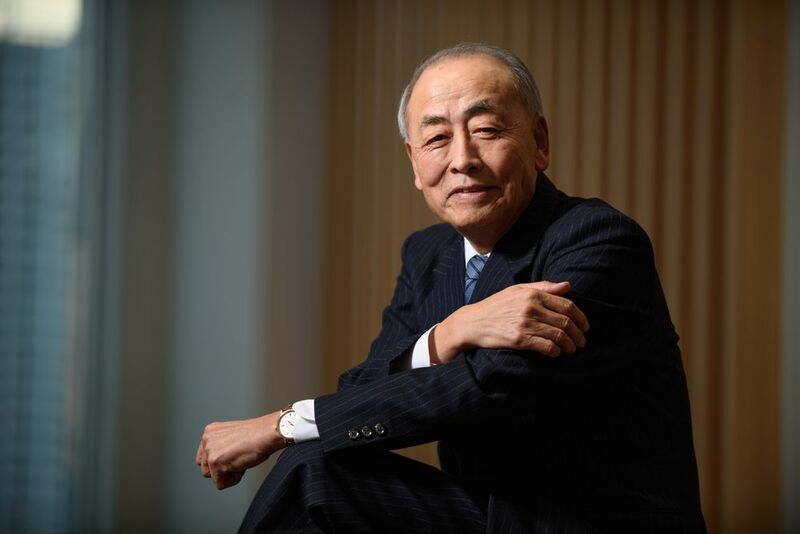 Daifuku is considering raising its earnings guidance for the medium term, according to Hojo, 69, who plans to step down as president at the end of next month. The need for more semiconductors in cars and robots, and consumers’ growing appetite for e-commerce and big data can only mean more demand for Daifuku’s machinery, he says, while China looms as a possible new market for expansion. Few outside of the chip industry will have heard of Daifuku, whose gear is found in cutting-edge Intel Corp. plants and helps Amazon.com Inc. move stuff around its cavernous warehouses. The Osaka, Japan-based company also supplies baggage-handling systems for the world’s biggest airports from Chicago’s O’Hare to Beijing and London. Daifuku was one of the biggest stock gainers in 2017 among its peer group of machinery makers as it racked up better-than-expected results. 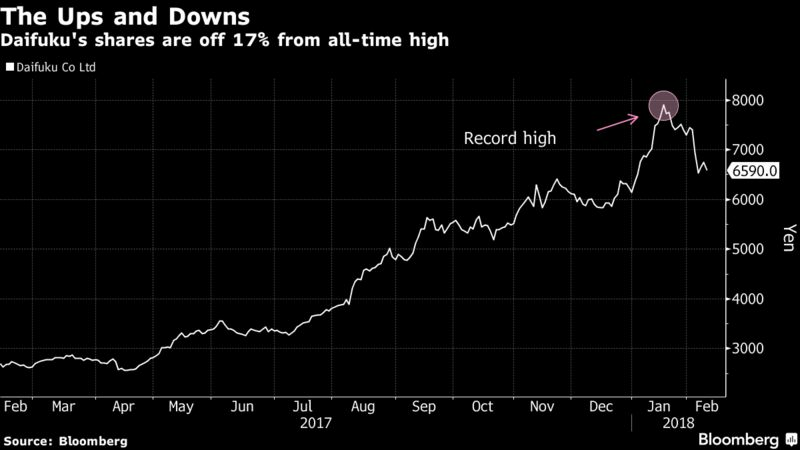 It climbed more than 1,200 percent over the past five years to reach a record in January, pushing Daifuku’s market value to 1 trillion yen ($9.2 billion) for the first time before paring gains amid a global equities selloff. Daifuku shares slipped 3 percent in early trading in Tokyo on Tuesday. Hojo, who has overseen the company as CEO since 2008, sat down with Bloomberg News to talk about Daifuku’s prospects and challenges. What issues determine the decision on profit targets? Masaki Hojo: Price gains in DRAM are slowing. On the other hand, the application for semiconductors continues to expand beyond smartphones and traditional computers to automated cars, among other things. We are really benefiting from the good environment we’re in, but we also have to be cautious and be flexible. We want to see how the company does in the new fiscal year and think about how much should be, if needed, revised and how much the operating margin target could be raised. How is the outlook on demand from China? We’re not seeing it weaken. We want to see how things go for the next three years though. For now, we don’t expect to see any extreme drops. China is a market we’ve never seen before. Basically demand has been from Taiwan, South Korea and top makers in the U.S. But China has set a policy to produce the chips it consumes within the country, which means more and more aggressive investments of equipment from both existing companies and newcomers in the industry. What about demand from e-commerce companies? Amazon is actively investing and we’re supplying machines that are profitable. In Japan retailers like Nitori Holdings Co., which sells furniture, is investing big to set up new distribution centers for operational efficiency. In China, companies like Alibaba Group Holding Ltd. and Tencent Holdings Ltd. are investing. South Korea will catch on, taking cues from Japan, and while it will take time for India’s e-commerce market to develop, it’ll be a big market once it does. Why is Daifuku’s machinery important for e-commerce? Nowadays, there’s a complete overlap between information-technology and distribution. Distribution is about how accurately merchandise could be delivered to customers. In Japan, retailers are investing in distribution centers also to solve problems -- like not having enough human resources to deliver goods. What’s your take on Daifuku’s stock price? What is Daifuku’s next step? We have to be able to come up with various suggestions for clients. It’s not simply going to be about a hardware or software but about providing a high value-added system equipped with cutting-edge technology. Otherwise, we can’t be a real champion. Health care, biotechnology, agriculture are among the industries Daifuku could tap. We’re going to try and see if a type of power-supply machines used in chip factories could be put to use in the biotechnology industry.